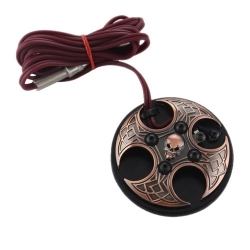 This Cross Wing Foot Switch is another innovation from New Age Tattoo Supply. It is made from aircraft aluminum, easy for carrying in tattoo convention. Hybird Phone Jack End – NOT CHEAP POOR QUALITY. Non-slip foam pad on the bottom.